Summer is here! It is time for sleeping in, heading to the beach, and hanging out with friends. 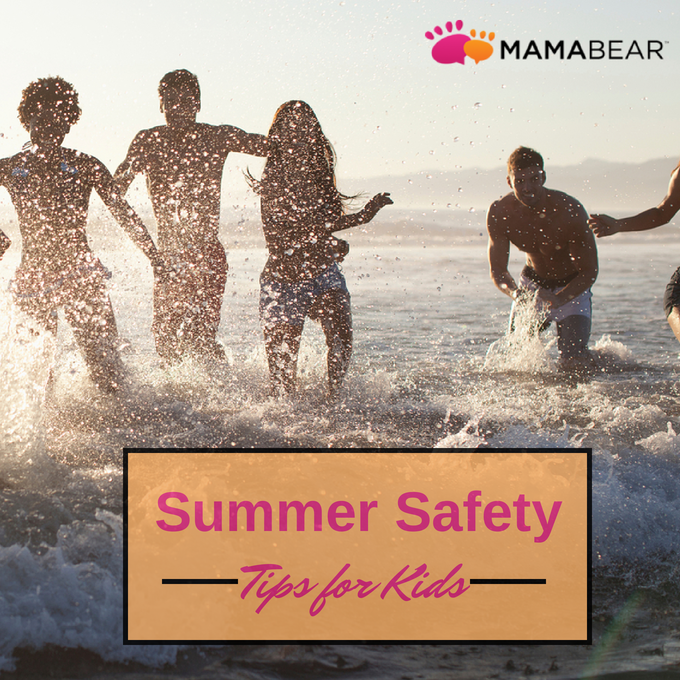 Help your kids enjoy their extra time, allow for some freedom and independence safely with some tips from MamaBear. If you need to be away while your kids are at home, make sure they keep their charged Smartphone with them for quick connectivity. Standard stranger danger rules apply especially not answering the door for people they don’t recognize or chatting with strangers virtually. With the help of the MamaBear App, you can quickly pinpoint their current location and request they check-in with you with a quick tap of an emoticon. Whether they are at the beach or a local pool, your kids should know how to swim. Swimming classes are available for all ages – even infants! This is a life saving skill that everyone should have. Make sure that your kids know to apply sunscreen every hour, are aware of the location of the lifeguard station, and know the signs of a swimmer in distress. Before heading out, make sure their phone is fully charged and location services are on. Summer is a great time for our kids to connect with friends for activities they don’t have time for during the school year. Let them stretch their boundaries by going to the mall with a group, catch a movie, or join a family friend on a road trip independently. Remind them to remain a part of the group, never leave with someone they don’t know and have a plan for emergencies or what to do if they get separated. Using MamaBear can give them a safety net with a discreet tap of the “Come get me” button and you’ll feel better knowing you’re virtually holding their hand. Despite parents’ best efforts, extra free time will mean more time online for our kids. Discuss online safety with your kids. One of the most difficult things for kids to understand is that not everyone online is who they say they are. The 12 year old girl that they think they are chatting with just might be a child predator. Thankfully, you can monitor need to know information with the MamaBear App. MamaBear lets you know when your child has a new follower or follows someone new on Instagram and Twitter and who they’re friends with on Facebook. You’ll have a preview of Instagram photos uploaded and you can customize a keyword list to be notified of particular language or indicators of bullying. Let’s empower our children to enjoy some independence with summer activities with their friends. You can help them do it safely by knowing more and staying connected with MamaBear.